A folding kayak is a direct descendant of the original Inuit kayak made of animal skins stretched over frames made from wood and bones. A modern folder has a collapsible frame made of some combination of wood, aluminium and plastic, and a skin made of a tough fabric with a waterproof coating. Many have integral air chambers inside the hull, making them virtually unsinkable. The first workable folding kayak was built by Alfred Heurich in 1905, a German architectural student. Heurich paddled his creation on the Isar River near Munich and took out a patent on the design, called the Delphin (German: Dolphin), the following year. The Delphin had a bamboo frame with a sailcloth hull stretched over it. It could be folded up and carried in three bags, each weighing less than 4.5 kg (9.9 lb). The folding kayak was made commercially successful by Johannes Klepper, whose factory was at Rosenheim, Germany. Klepper kayaks were very popular for their compact size and ease of transport. Klepper's Faltboot was introduced in 1906, many years before hardshell boats were commercially produced. Oskar Speck undertook his seven-year journey from Germany to Australia in the 1930s using folding kayaks made and sponsored by another manufacturer, Pionier-Faltboot-Werft. During the Second World War the British and Commonwealth special forces employed "canoes" in the Mediterranean, European, and South-east Asian theatres. The special forces of the day (COPPS, RMBPD, etc.) had developed for them about a dozen state of the art "canoes" which were given the codename Cockle. [n 1] These Cockles ranged from the Mk 1 early frame-and fabric 'folbot' type to the four man boats made of aluminum alloy; most were 'collapsible' rather than being boats that could be completely disassembled, as with modern-day folding boats. The Mk 2 could be collapsed but along its 15 ft length... to just c. 7 inches. This Mk 2 and its three-man Mk 2** were all of the same design and were designed by the same man—a Mr Fred Goatley. The Cockle Mk II was used by the RMBPD in Operation Frankton, the attack on Bordeaux in late 1942. Walter Höhn (English; Hoehn) developed and built the first Swiss folding kayaks, which were tested in white water conditions, in 1924. Hoehn emigrated to Australia in 1928, bringing two examples of his boat designs with him: A 1-man and a 2-man design. His boats were patented (Aust. Patent 117,779) and initially produced for sport use. During the Pacific war, Hoehn and Hedley's P.L. built a total of 1024 folding kayaks, called 'folboats', for the Australian military from the Hoehn design. Hoehn supplied the first 2 folboats for the highly secret 'Operation Jaywick' training at Camp-X near Sydney in 1942. Hoehn's first military model designated 'Folboat Kayak Type' was succeeded by the 3-seater MKIII. The MKIII was successfully used in many raids during the Pacific War. Hoehn's first army folboats were tested at the ZES commando base in Cairns, Queensland by commandos under the direction of Major Ivan Lyon for preparation of the Operation Jaywick raid. They included Capt. Sam Carey, Robert Page and Albert Sargent. They were also used for training and actual use in Operation Rimau. At least 33 raids, reconnaissance patrols and rescue missions in the Pacific Islands, notably RIMAU, COPPER and PYTHON used these folboats. The Klepper Aerius II model was introduced in 1951 and is still in production. In 1956, Dr. Hannes Lindemann crossed the Atlantic Ocean in an Aerius II, proof of the folding kayak's integrity and seaworthiness. Their light weight and non-metallic construction has made them the choice of many military special forces. Nautiraid of France produces a special model for military use, as do Klepper and Long Haul, who supply German and US Special Forces, respectively. The newest design innovation has come from Canada's TRAK Kayaks, who in 2007 have come out with a polyurethane skin over aluminum frame design with hydraulics in the cockpit to make the skin extremely taut and also to change the shape of the hull for varying paddling conditions. There are about ten major folding kayak manufacturers today, and a handful of small, one-off makers. In addition to Klepper the best-known brands are Feathercraft, Folbot, Triton advanced, Long Haul, Nautiraid, Pakboats, Pouch and TRAK. Long Haul double kayak hulls are identical in form to Kleppers (as well as a good many older boats), so a Klepper Aerius II frame can be used with a Long Haul MK-II skin, and vice versa. 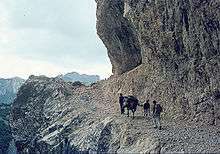 On the way to the put-in with 2 Folboats by train, bus and finally donkey. Most folding kayaks have very similar construction, even though the materials may differ. Some boats use frames made of mountain ash, spruce and marine plywood, while others use aluminium tubing and various plastics, and a few newer boats such as Fujita and Firstlight use carbon fiber or glass-reinforced plastic tubing. Typically there are solid bow and stern pieces, and anywhere from three to seven ribs connected via some sort of flexible attachment to a number of longerons. 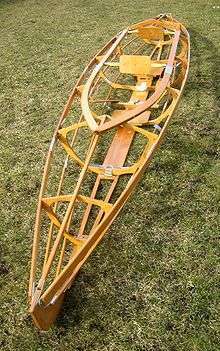 Many boats follow the basic design pioneered by Klepper in having a folding set of floorboards and gunwales as well as additional longerons to add stiffness and shape. Many folding kayaks also use air sponsons (up to four in the Klepper Quattro) to tighten the skin on the frame and to adjust the shape of the hull. Most folding boats have two-part skins, with different materials used for the deck and the hull. Decks can be made of a breathable cotton/hemp blend, as Klepper has done since their early days, or of coated synthetics, as Feathercraft, Folbot, Long Haul, Nautiraid, Pouch and TRAK do. Each approach has its own particular benefits and drawbacks; all work well in practice, and some companies, such as Long Haul Folding Kayaks, offer both materials. Hulls are generally made of a heavily coated synthetic fiber. In the early days, rubber coated cotton canvas was used, while the modern boats use a synthetic elastomer —Hypalon, polyurethane or PVC—over a synthetic (typically Dacron) cloth. The tension on the hull is what gives certain folding kayaks performance advantages over others. One manufacturer (TRAK) incorporates several hydraulic jacks into the frame that allow the user to change the hull's shape. Assembly time and mechanisms or designs vary by manufacturer and model. Assembly times can be as little as 8–10 minutes or can reach upwards of 40–45 minutes, depending on the design of the kayak and the skill of the assembler. 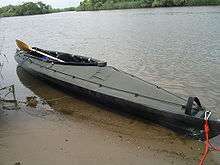 Military commando teams can assemble a large Klepper or Long Haul double kayak in around 8 minutes or less. Disassembly is typically half the assembly time. The Oru Kayak uses the principles of origami to construct a 12 ft (3.7 m) long kayak using a single sheet of corrugated plastic as both the ribs and skin. The Oru kayak folds into itself to form a carrying case when not in use. The stability and design robustness of several folding kayak models makes them ideal for upwind and downwind sailing. Dr. Hannes Lindemann's Atlantic crossing was in most part achieved by sailing. Folders are known for their durability, stability, and longevity: The Klepper Aerius I (a single-seater) was used successfully in the early days of white-water kayaking before the era of modern polyethylene boats, owing to its durability and excellent manoeuvrability. Some well-maintained Kleppers have been in use for more than 25 years. Although a few hardshell kayakers are critical of folding boats, and do not regard them as in the same category as hardshell boats, folding kayaks exhibit many of the same paddling characteristics as the original skin-and-frame vessels of the circumpolar north. Other than contemporary versions of Inuit, Aleut, and Yup'ik kayaks and baidarkas, they are the closest relatives to the skin-and-frame boats of the past. The performance of these folding kayaks depend largely on the design of the kayak. The speed may be comparable to sea kayaks made from composite materials such as fibreglass or carbon/kevlar. In general, most folding kayaks trade off some performance in speed for the ease of travelling with a kayak. This is because the sponsons found in most modern folding kayaks makes the kayaks wider; this increases drag and slows the kayak down. Many in the folding kayak community believe folding kayaks and other skin-on-frame kayaks offer features that aid paddling efficiency. In a hardshell kayak, waves and chop on the water can slow down the momentum of the craft and push the kayak back. Some hypothesize flexible skin on such kayaks help the kayak absorb the energy of waves and current, which allows the boat to move more easily through rough conditions. Some paddlers find skin-on-frame kayaks to be very efficient paddling rougher waters, while many simply enjoy the feeling of closer contact with the water and waves. The folding kayak that used to belong to pope John Paul II has been on display at the Archdiocesan Museum in Kraków, Poland since 2003. When already a cardinal, the future pope shared the ownership of "The Pebble" with a student friend of his, who later donated it to the museum. ↑ Kayaks in Europe were historically referred to as "canoes"; what most people think of as canoes were referred to as "Canadian Canoes". ↑ Oru Kayak. "Folding Kayaks That Go Anywhere - Oru Kayak". Oru Kayak. Retrieved 20 January 2016. ↑ YouTube. Retrieved 20 January 2016. Hoehn, John (2011). Commando Kayak: The Role of the Folboat in the Pacific War. Zurich, Switzerland: Hirsch Publishing. ISBN 978-3-033-01717-7. Rees, Quentin (2009) . Cockleshell Canoes (2nd ed.). Stroud, Gloucestershire: Amberley. ISBN 978-1-84868-065-4. Rees, Quentin (2010). Cockleshell Heroes - The Final Witness. Stroud, Gloucestershire: Amberley. ISBN 978-1-84868-861-2. Wikimedia Commons has media related to Folding kayaks. Folding Kayak Builders Manual from Yostwerks, details on building a folding kayak.